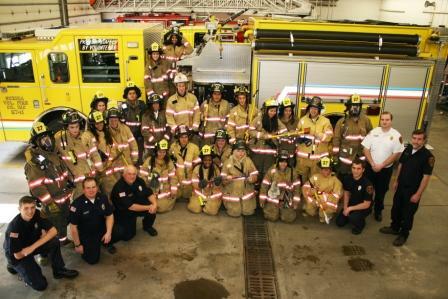 SCRIBA, NY – 23 foreign exchange students from 19 different countries around the world, which are living locally in the Upstate New York area, were hosted by the Scriba Volunteer Fire Department at their fire station on State Route 104 on December 1. The students were given a tour of the station and fire equipment. The highlight of the tour was the students trying on the turnout gear worn by the firefighters. Scriba is always looking for new members, please stop down and ask about what you can do to help, or visit our membership page at: http://www.scribafd.org/joinscriba.html and complete an application.